The X-Planes conjure up images of Chuck Yeager first breaking the sound barrier in the X-1 or of the black, bullet-shaped X-15 streaking through the skies at over Mach 6. But there have been 48 more X-designations assigned, as well as a host of other experimental aircraft that did not fall into the formal X-series. Some of these investigated very low-speed flight, vertical take-off, or were technology demonstrators for production military aircraft. Others were missiles, or gliders. One was supposed to be a spacecraft. This book does not limit itself to the formal X-series of aircraft, but instead covers many of the experimental aircraft used by the U.S. military and NASA for flight research. 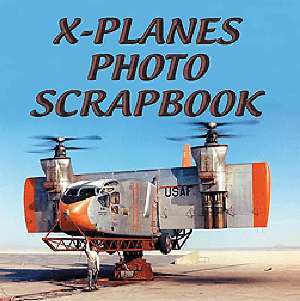 Dennis R. Jenkins has assembled an outstanding collection of photographs of the X-Planes from government and company archives, as well as personal and public collections. Hundreds of photos &endash; some in color and many never-before-seen &endash; detail the modern history of experimental flight. 9" x 9", 180 pgs, Softbound. 450 black & white photos, 50 color photos.